Apologies but Clarence has been travelling. Back now. The ASX 200 closed up 22 points to 5866 closing on its highs. A quiet day volume wise as the market waits for a new catalyst. Jobs numbers helped overcome early negativity but no real conviction on the follow through. We have seen plenty of quarterly production reports with rising costs the theme both for small gold miners and also large caps like BHP. Unemployment up 21,600 jobs with P/T employment jumping on Xmas hirings. The headline number at 5% leaves the RBA with some rare good news. The AUD slipped slightly on the number. NAB, the last of the big four to lift mortgage rates, by 12-16bps, will not help the housing market stabilise. ASX 200 u p 22 to 5866 in modest trade. NAB raises mortgage rates by 12-16bps. Resource production reports show rising costs. Energy sector rises on STO production report. Jobs data cheers at 5% unemployment. Banks flat line though MQG shines. AUD slightly weaker at 71.21c on jobs number. EVN – 4.13% another gold miner with rising AISC. OZL +3.38% beats production expectations. APT +2.36% status quo to remain? BSL +4.34% some bargain hunting. NST -5.41% brokers negative on rising costs. AMP -1.93% RC findings beckon. Remediation issues in focus. SFR +2.99% resignation of company secretary. WOR +2.75% production reports cheer sector. BYE +% positive news to come on drilling. Speculative stock of the day: Berkeley Energia (BKY) +25.93% after a positive quarterly report and speculation on Spanish approval for its Salamanca project. Big volume move. Santos (STO) +3.86% Quarterly update shows production up 6% on quarter to 15.9m barrels, sales revenue up 7% on quarter to US1.04bn and sales up 19% to US$3.7bn. 2019 output forecast to be in the range of 71-78bn barrels and sales expected to be 88-98m barrels. Vicinity Centres (VCX) – 1.92% Saw a net valuation decline of $37m from their total property portfolio as at 31 December 2018 following independent valuations of 38 of the companies 62 properties, and internal valuations on the remainder. The fall represents a 0.2% decrease in portfolio value for the 6-month period up to December 31. The valuations are subject to a final audit and will be confirmed in the FY19 interim results on February 15. AUB Group (AUB) –0.41% Appoint Mike Emmett as CEO and Managing Director effective March 11 2019. Mr Emmett was previously CEO of Cover-More and has held roles with QBE, EY, Accenture and IBM. Evolution Mining (EVN) – 4.13% Q2 report shows gold production down 9% on the prior quarter to 181,966oz. The report stated an AISC of $973/oz and an IAC of $1284/oz with FY19 cost expected to be at the top end of the annual target. FY production guidance has remained unchanged. The December employment report shows 21,600 jobs created and a drop in the unemployment rate to 5%. The market was looking for 18,000 jobs created and a flat unemployment rate of 5.1%. 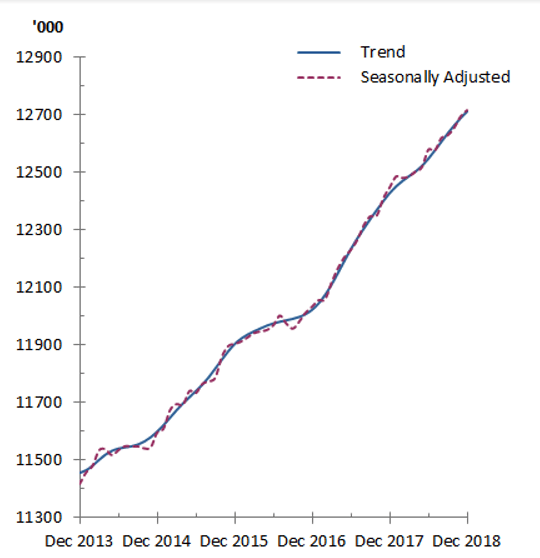 The trend monthly hours worked increased by 0.1% in December 2018 and by 1.5 % over the past year. The NAB Residential Property Index fell to a new survey low in the fourth quarter of 2018. Overall, the index was down 11 points to -20 (from -9 in the third quarter) and below its long-term average level (of +12). NAB has finally joined its three competitors in lifting rates for mortgage borrowers. It claims it has done so reluctantly as funding costs have risen. The bank says it saved customers $70m from its delay in raising rates. Next RBA meeting will be interesting given the slowing economy yet jobs holding up well. Maybe not so clear cut for a rate hike at all. The Commonwealth Bank flash PMI fell to 51.5 in January, the lowest reading since the index started three years ago. South Korea leaves rates unchanged. Japanese manufacturing growth has stalled after longest growth run in ten years. Chinese retail conglomerate Wuhan Zhongnan has announced plans to buy Alibaba-backed Easyhome, a furniture and home improvement supplies retailer, for up to US$5.6bn. Bing blocked in China. Seems that the Microsoft backed search engine will not be available in China. Trump has said he will deliver the State of the Union (SOTU) address when the shutdown is over. Buzzfeed has cut 15% of its workforce. UK Labour party is seeking ways to delay Brexit. PM May still trying to sell Plan A. And finally….this is gold…thanks Al. Look away children if offended…. So they started playing and enjoyed the game and the company of the newcomer. “I’m an assassin, a hit man,” was the reply. “No, I’m not,” he said, reaching into his golf bag, and pulling out a beautiful Martini sniper’s rifle with a large telescopic sight. “Wow, I can see my wife in the bedroom. Ha Ha, I can see she’s naked! !